1. An Advanced Reading Copy (ARC) of Mirror Ball by Matt Redman - I also know Matt as a worship leader, songwriter but not as an author. This would be pretty interesting. In this newest book of his, Matt reminds us that even when we fell insufficeint to reflect God's glory, God can show through us as light radiates through a prism. Living in this truth will transform how we view our worlds, our relationships and our daily lives. 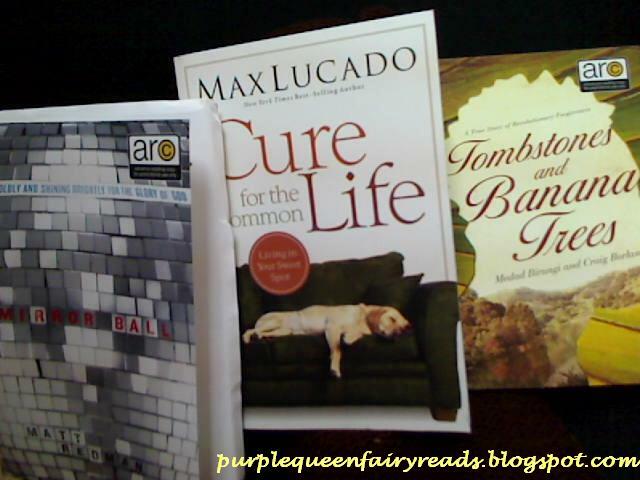 2.Cure for the Common Life by Max Lucado - in this book, Max offers practical tools for exploring and identifying your own uniqueness, motivation to put your strengths to work and the perfect perscription for finding and living in your 'sweet spot' for the rest of your life. 3. An ARC of Tombstones and Banana Trees by Medad Birungi and Craig Borlase - the true story of Reverend Medad Birungi, a Bible teacher, lectuere, pastor and founder of World Shine Ministries, an organisation that evangelizes, disciples and intercedes in prayer in Uganda and around the world. Here's a song by Matt Redman that I like. Hope it will be a blessing to you this weekend.